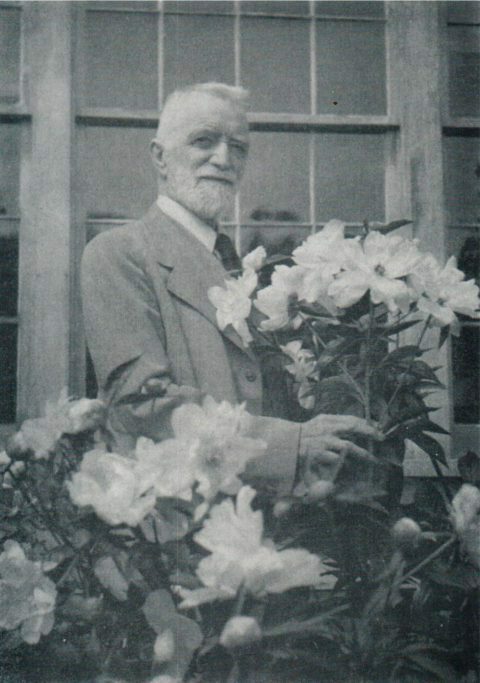 Prof. Arthur Percy Saunders (March 22, 1869 – August 14, 1953) is probably the most well-known peony hybridizer the world has ever seen. 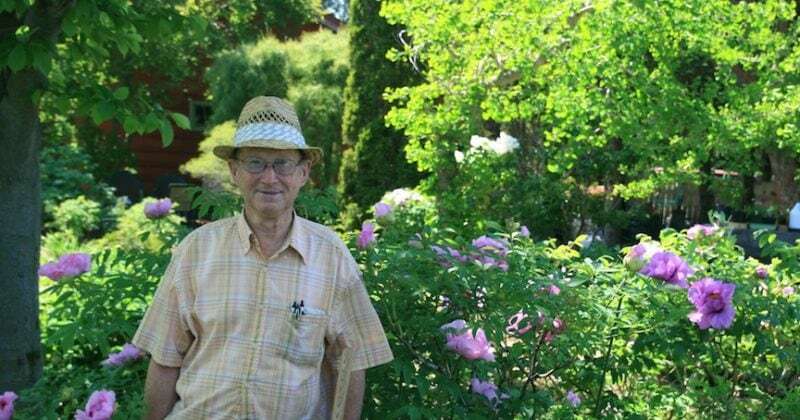 He was responsible for bringing many new species into the gene-pool of our garden varieties, thus bringing new colors and a longer flowering period. Most information about the man and his works can be found in many of the American Peony Society (APS) publications. Below you’ll find what I believe to be the best description of the work he has done, it is a section of a chapter in one of those books. If you still want to know more about him or his publications, it would be best to join the APS and order the books they have on offer. Clearly a paeoneer, A.P. Saunders in 1953 (at the age of 84), with some ‘White Innocence’ peonies, one of his many introductions. One more remark: many of the species he used have now been renamed or lumped together with other species, the most important one of these would be P. albiflora which is now known as P. lactiflora, I have tried to give the current name when known within parentheses. 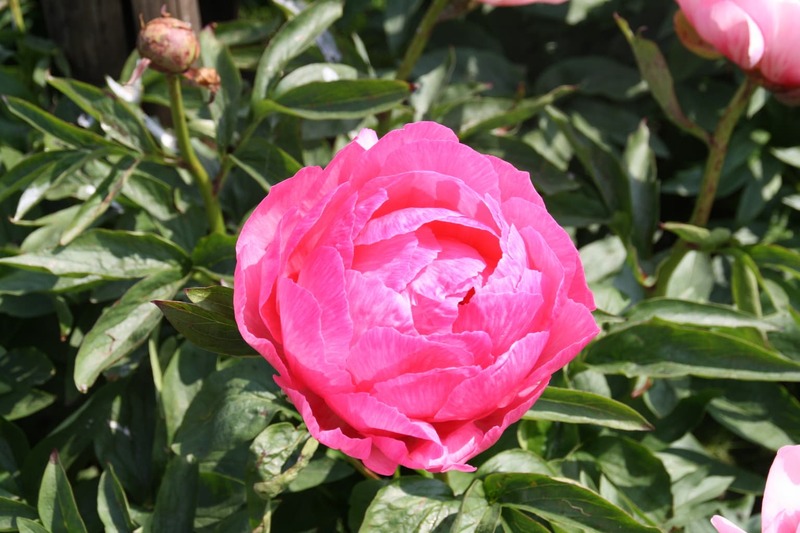 It has already been pointed out that Professor Saunders was not the ﬁrst to make crosses between peony species. He was, however, the ﬁrst to bring together a large assemblage of species— the vast majority of which had never been used before in crossing. He was the ﬁrst to systematically try to intercross each one of these species with every other one. He created more hybrid races and more new hybrid varieties than all other breeders, past and present, put together. His work in creating these new hybrid races is the greatest peony achievement of this, or any other, century. Dr. Saunders was born in 1869, the son of the Director of the Central Experimental Farm at Ottawa, Canada. He grew up in a botanical and horticultural atmosphere. He was graduated from the University of Toronto and took post graduate work in chemistry in Berlin, Goettingen, and ﬁnally at Johns Hopkins where he received his doctorate’s degree. In 1900 he was appointed professor of chemistry at Hamilton College in Clinton, New York. He continued his professorial duties until his retirement at the age of seventy in 1939. He lived in the same house, and worked with peonies until his death in 1953. 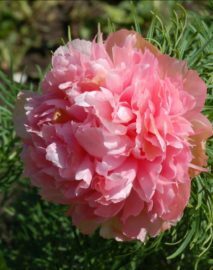 Professor Saunders [as most of his peony friends called him] joined the American Peony Society in 1906. He served as a Director of the Society from 1909 almost continuously until his death. He was Secretary from 1910 to 1924. Editor from 1916 to 1924, Vice-President from 1928 to 1930, and again from 1936 to 1938, President from 1930 to 1932. He was a member of the Seedling Committee from 1925 until his death. In June 1928 he was awarded the American Peony Society’s Gold Medal for his success in hybridizing peony species, and in 1947 received the Arthur Hoyt Scott Horticultural Award of Swarthmore College, one of the highest awards in horticulture. 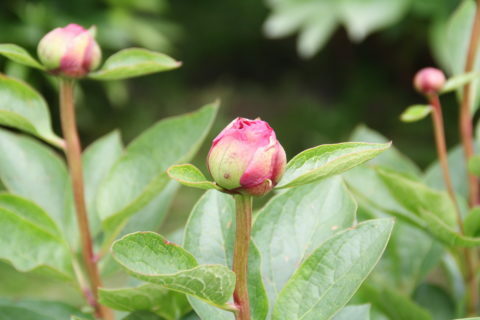 He began to raise Chinese peony seedlings as early as 1905. By about 1915 he had secured plants of several authentic peony species, and began his work of the hybridization between species, exhibiting the ﬁrst varieties of the Challenger Strain in 1928. In addition to his profession and his peony hobby, Professor Saunders had many interests. He was deeply devoted to the College and attended all its functions, usually accompanied by his family. He set up a telescope near his home so that college boys might gaze at the stars. Ice skating was a favorite sport; birds were a constant delight. Chamber music was throughout his life a beloved occupation: he played an excellent ﬁrst ﬁddle. Through it all ran the supreme and engrossing occupation of the garden. There was, to begin with, a constant supply of fruits and vegetables for the big family table. In the ﬂower garden besides peonies, almost every other garden plant was at least given a try. Iris were hybridized — one variety, White Knight, received an Award of Merit from the Royal Horticultural Society at the Wisley Garden Trials. Roses there were too, but they were soon abandoned because they required too much coddling to survive Clinton winters. The tiny cyclamen species were grown, nurtured and loved. In the autumn, colchicums produced sheets of mauve bloom. The turnover was tremendous; always about ﬁfty per cent. It had to be. Plants arrived to be tried out, and those that did not soon give a good account of themselves were discarded to make way for new or better ones. Already by 1905, besides seventy-ﬁve iris and thirty-nine phloxes [Professor Saunders later raised and named the ﬁne white, Mary Louise, still considered a leading variety today] there were no less than two hundred forty-eight peonies! Garden notebooks were started in 1900, the peony notebooks in 1903; both series were continued almost up to his death. 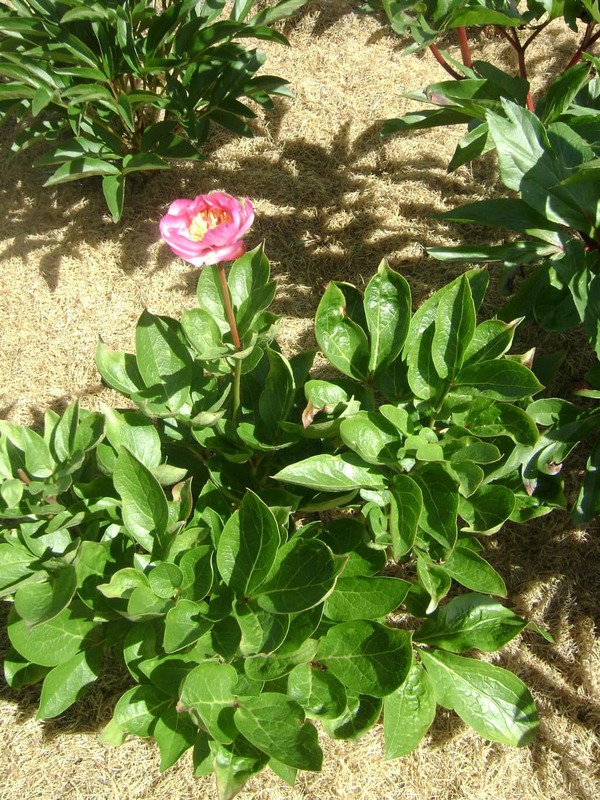 The term “peony” of course referred in those early years, aside from two or three insigniﬁcant species and perhaps a dozen or two ﬁne Japanese tree peonies, to the albiﬂora race (lactiflora, kh). New varieties came into the garden in a steady stream every autumn, while the poorer sorts were as steadily culled out and thrown away every June. 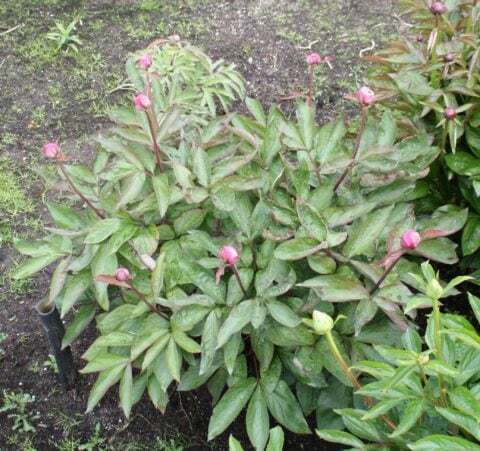 The early work with peonies was not hybridizing at all in its true sense for it was purely on these albifloras. 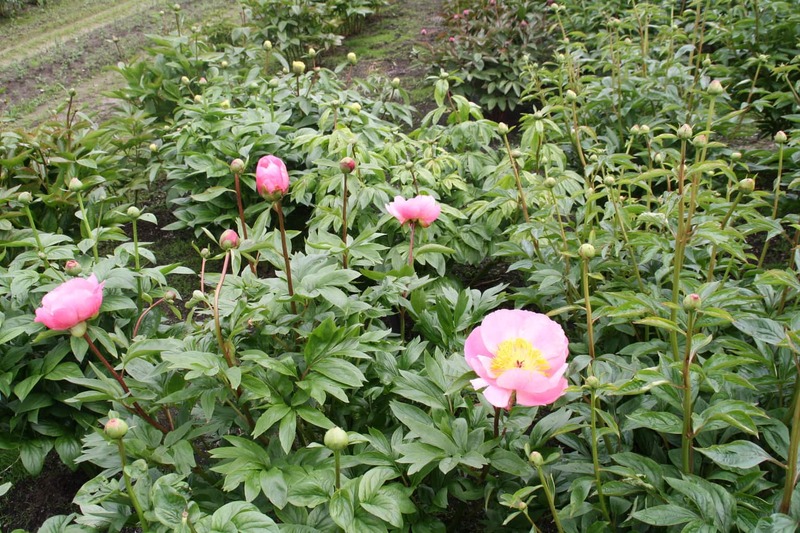 A great many seedlings were raised and many were taken to the national peony shows, which were an annual June trek. “Staged in Cleveland in 1913,” he writes, “thirty-two varieties of Chinese peonies plus four-ﬁve undistinguished seedlings.” Some of the best were eventually put on the market, and two now survive in nursery lists: the deep red Matilda Lewis, and the lovely light pink semi-double named for his daughter, Silvia Saunders. The role played by the albiﬂoras has been a dual one: not only were they favorite garden plants, but their many ﬁne qualities have given them great importance as the mother plants in a large majority of the new hybrid races. Other species, it was hoped, would provide extension of season of bloom, wider variation in foliage, and the possibility of new and beautiful ﬂower colors, notably in the region of ﬁne bright pinks, and perhaps even of yellows. So when several distinguished foreign botanical species began to arrive to take up their abode on College Hill in Clinton, they were given places of honor. P. lutea, the wild yellow tree peony from China, was sent by Lemoine in 1913; lobata arrived the following year; and macrophylla and mlokosewitschi were procured from van Tubergen in 1915. These new plants marked the opening of a new era. “My main purpose in all this work of cross-fertilization,” Professor Saunders later wrote, “has been to strike out if possible into new lines that would produce early ﬂowering types in greater variety and beauty than we have heretofore had.” Few would deny that in his thirty years of hybridizing he succeeded admirably in this quest. The Season of bloom has been extended by two or three weeks. Formerly, the only early-blooming herbaceous kinds were the old familiar forms of officinalis, of tenuifolia, and of the Lemoine wittmanniana hybrids in pale tearose shades. These plants were all lacking in some respect of beauty, variety, or vigor of growth. Only the ofﬁcinalis varieties were at all widely grown. Now through the use of May-blooming species, and in particular those very early three, “Macro,” “Mloko,” and “Tenui,” that bloom May 12 to 15 in Clinton, hybrids have been created that ﬂower throughout the second half of May and into the ﬁrst week of June to overlap the albiﬂora race. But in the new brilliant range of colors an even greater improvement has occurred. There are new reds in vermilion, scarlet and cerise; new shades of true pale lilac; new waxy whites with striking ﬂarings or edgings; new ivory and opalescent shades; but most important of all, an entirely new range of pinks, in salmon, coral, flamingo, and cherry—colors which had existed in the Japanese tree peonies, but never before in the herbaceous group. To obtain these hybrids, Professor Saunders embarked on a campaign of crossing, the extent and intricacy of which he himself did not at ﬁrst foresee. In the end, the total number of peony plants that either immigrated into the Clinton garden from the outer world, or were born here, was 17,224, this being the number of the last plant in Volume 23 of the Peony Notebooks. Allowing an ample thousand for all the pure albiﬂoras, another thousand for the tree peonies and their hybrids, and ﬁve hundred for all the species plants, there remain over fourteen thousand, ﬁve hundred to cover the vast number of herbaceous hybrids. Of these, some one hundred sixty-ﬁve were selected as worthy to be named, propagated and put on the market —a little more than one per cent. Most of these bid fair to become permanent additions to American gardens. It was not only as a garden plant that the peony held fascination for Professor Saunders. As he worked, he became more and more engrossed in the scientiﬁc aspects of the species, whose characteristics he was able to observe not only in the plants themselves but in their hybrid offspring, and with the attempt to bring order and classiﬁable knowledge out of chaos and disorder. 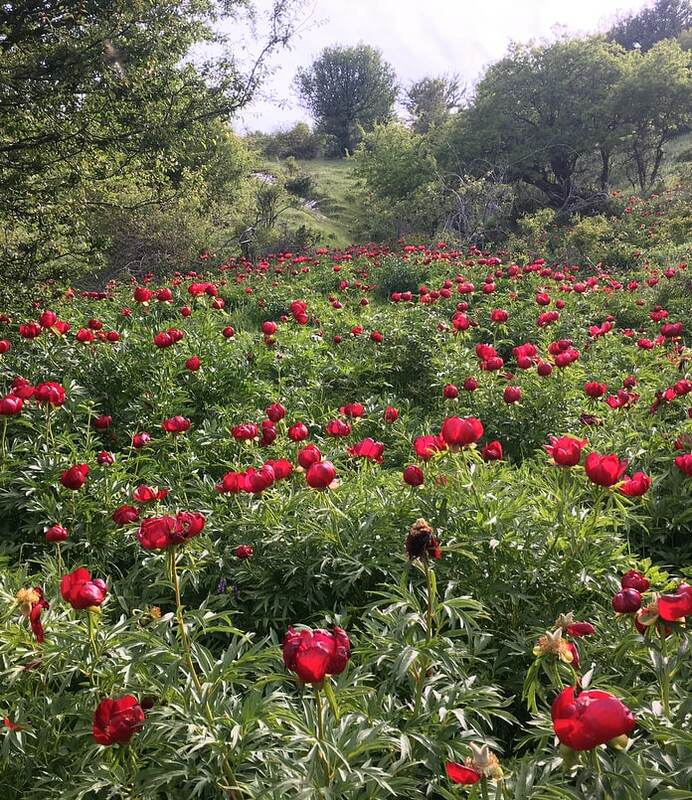 The interesting new species that were beginning to be sent him by plant collectors and botanical gardens in Europe, and particularly England, were the wild peonies from the borders of the Mediterranean, the Caucasus, the Himalayas, and China. Neither Professor Saunders, nor indeed any other American, had ever seen most of these plants. They were then, and many of them still are, unknown to American gardens. A good many new kinds were in the ground in Clinton and showing their true colors by 1925 when Professor Saunders was asked to write the chapter on species in the Society’s Manual. There existed at that time no complete or up-to-date study of the peony, and the Manual, published in 1928, stood as the authoritative work until about 1943 when the ﬁrst parts of Sir Frederick Stern’s A Study of the Genus Paeonia were published in England by the Royal Horticultural Society. Professor Saunders, not always in complete agrement with Sir Frederick in matters relating to the classiﬁcation of the species, had, as a hybridist, special opportunity to study compatibilites. He reached the opinion that the ability of two species to intercross, while not alone in itself proof of relationship between them, did serve to strengthen the supposition that they were related, provided there were other reasons to suppose so. To follow through a really complete and scientiﬁcally planned program, it was necessary to cross each species, or form of species, onto every other, species, or form of species, and then all over again the other way round, for a given cross usually yields entirely different hybrids when made in the opposite way. 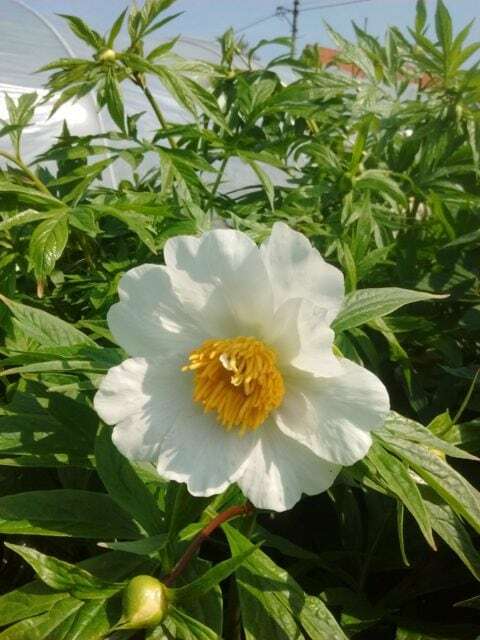 In addition to the many herbaceous species, there were the tree peonies, consisting of two important groups, the Japanese tree peonies and P. lutea, the wild yellow tree peony from western China. All these were crossed onto one another, even to the extent of crossing the trees onto the herbaceous and vice versa. For who shall say, until it has been tried, tried, and tried again, whether or not a hybrid between the tree and herbaceous can be made? Added to these were many small run-of-the-mill, acceptable, even expectable failures. Failures due to unviable [lifeless] pollens were eliminated by pollen-testing, begun soon after 1920. Failure through having tree peony seeds frozen in winter was overcome by the building in 1928 of a small frost-proof cellar set into the slope of the recently acquired strip of land up College Hill, named “The Ribbon” from its shape. Decora and peregrina, for example, are now considered to be at least closely allied to, if not actually forms of, officinalis. The name peregrina has in fact often been employed as a synonym for officinalis. Stern considers lobata and others synonyms of peregrina. 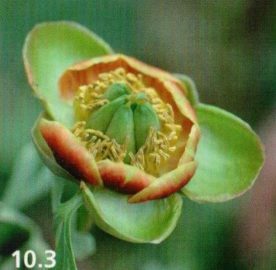 The most recent and complete article by Professor Saunders on his herbaceous hybrids was published in the American Peony Society Bulletin for September 1941. Even this account covers only those strains of which one parent was albiﬂora. Albiflora played a major role in the work of hybridists generally; in Clinton it served as parent to a full eighty percent of the hybrids. Not only that, but included within this four-ﬁfths are almost all the most important strains: the “Challengers” the outstanding “Lobata hybrids,” and the “Chalice” group, to mention but three. It seems suitable here again to allow ﬁrst place to those groups, and to give later attention to the remaining strains, those made without benefit of albiﬂora. Officinalis and its many relatives grow wild over much of southern Europe. Long ago introduced into European gardens, they have given rise to a number of garden varieties, double as well as single. Rubra Plena is the best known. There is a good deal of confusion as to the origins and the nomenclature of many of these. Whether lobata, officinalis, Otto Froebel, etc., are, or are not, related to one another, they give, when crossed with albiﬂora, hybrid strains that are all quite distinct from one another. 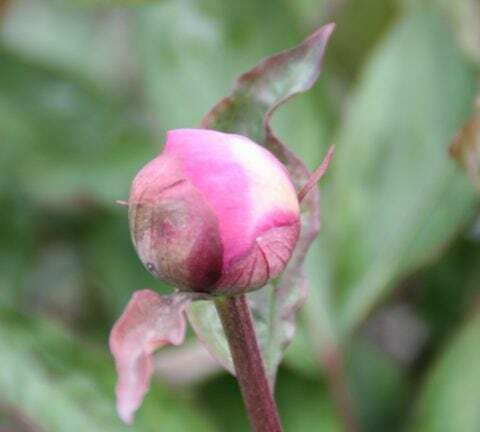 Officinalis in its many varieties has given not only a very large share of America’s herbaceous hybrid peonies, but many of these are of the highest quality, with new and vivid colors heretofore totally lacking in herbaceous peonies. Dr. Saunders’ notes say: “I have no plant of the wild P. officinalis that I can be sure is true. The forms of it that I have used, and there are many, are the garden varieties, and particularly a single crimson seedling of one of these which appeared in my garden many years back. He started in, about 1917, to cross this plant with Chinese peonies, and with great success, for it eventually fathered all those hybrids later brought together under the name, “Challenger Strain.” These are tall robust plants, stout and straight of stem, with glossy, almost tropical foliage, and the ﬂowers in shades of vivid crimson, sometimes measuring eight inches wide. The cross takes with fair ease, giving an average of about six seeds per cross. In 1921, two hundred and twenty-three seeds were gathered, which produced thirty-three plants, of which three were introduced. The strain includes Challenger, Defender, Mariner, Erebus, and Tantrums. The mother of the ﬁrst two was the great seed-setting albiﬂora, Primevere, which has also produced Chalice and other hybrids. Tantrums has a huge center of tousled golden stamens; Mariner and Erebus are deepest maroon red; all are single. The blooming season in Clinton is from late May into early June. “A group that has greatly interested me is that derived from the variety Otto Froebel.” This plant bore rosy-salmon ﬂowers, and produced among its hybrid children several very brilliant pinks; they were the nearest to a true “salmon” at that time [about 1931]. They appeared particularly well under the artiﬁcial lighting of the exhibit hall and won many awards, starting with their debut with the “Challengers” in 1928 in Boston. Lotus Bloom and Victoria Lincoln are still prized, but the rest were cast into the shade by the much ﬁner pinks that appeared in the late thirties in the great race of lobata hybrids. Among the many hybrids derived from still other forms of officinalis ﬁve are worthy of special mention: Edward Steichen (very dark red) and Postilion (scarlet crimson) are both from officinalis The Sultan. Emblem (very early), and Legion of Honor are two more good reds; and Madrigal, a pale blush double, is from the double officinalis Lize van Veen crossed by a double pink albiflora. These varieties are all reciprocal crosses, i.e. albiﬂora crossed onto ofﬁcinalis. Without any question the “Lobata Hybrids” are one of the two groups for which the Saunders name seems sure to live longest. [The other group, the “Lutea Hybrids,” are tree peonies.] The pollen parent of this strain is a plant which came in the autumn of 1928 from Amos Perry in England under the name of lobata. It bloomed the following June. Having learned through experience the rather poor compatibility between the Chinese peonies and certain of the ofﬁcinalis forms, of which loabata is one, Professor Saunders determined on a real campaign, and accordingly made this cross no less than one hundred and thirty-four times that month! The ﬁrst blooms from the 1929 crossess began to appear in 1933, and from then on, every plant turned out to be either a splendid red, with many scarlet and cerise shades new to herbaceous peonies, or a vivid pink in salmon, coral, flamingo, or cherry, with never a bad color in the lot and not a one that turns mauve in old age. They simply fade out through palest peach to silvery white. Almost all are singles; there are a few airy semi-doubles. Some forty of these have been introduced — about three percent of the total. A complete list of names will be given later; some that have proven most popular are Alexander Woollcott, Cardinal’s Robe, Carina, Heritage [a reverse cross], Red Red Rose, and Your Majesty, among the reds; and among the pinks, Claudia, Constance Spry, Cytherea, Grace Root, Janice, Julia Grant, Laura Magnuson, Lovely Rose, Ludovica, Nathalie, and Queen Rose. The cross is pretty generally sterile.The several hundred plants in the nursery yield not more than twenty-ﬁve to ﬁfty seeds in a season. These are always planted tenderly, for a beautiful F2 has come from one of them: the unique and lovely ivory-yellow Moonrise, a sturdy plant of great substance, harking back to who knows what pallid ancestor on its albiﬂora side? Here again, as often happens in many second-generation plants, all the original fertility has returned: six Moonrise set more seed than ﬁfty ﬁrst-generation plants. Those who may have lobata hybrids in their gardens would be well advised to treasure and plant whatever seed may be set. Decora and its white form are closely related to officinalis, and are by some considered to be botanical varieties or forms of it. Plants and seeds reached Clinton from nurseries in Europe in the years 1924-I928. Decora is described as a “magniﬁcent blood purple on quite a tall stem. Used pollen in many crosses, 1929.” One hybrid, the very early dark single red, Reward, was introduced. Decora alba blooms very early in spring. A great many crosses were made and two hybrids introduced, of which one is Camellia, a lovely double white rosette with palest peach blush at the base of the petals. P. macrophylla (“big leaf”) is one of four or ﬁve species that grows wild in the Caucasus mountains. This rather dwarf plant has small cup-shaped white ﬂowers with a strong odor of cloves [or is it nutmeg?] and its leaves are the largest, coarsest, and glossiest in the entire peony kingdom. A single leaﬂet often measures nine by six inches — huge for a peony. These give off a strong smell of English box in the spring sunlight. All the Caucasus species are extremely early, macrophylla vying with tenuifolia each spring as to which shall be the ﬁrst to bloom; usually between May 10 and 15 in the Clinton latitude. It imparts to its hybrid children a strong tendency to earliness. By this one cross alone, the peony blooming season was extended by two or even three weeks. Starting in about 1918, more than a thousand plants of this cross were produced, including the second, third, and even fourth generation, plus several lateral relatives. The vast majority are white; there are a few with pale blush tinge. All are single except as otherwise noted. This cross takes fairly well: over the random period 1926-31 it was made one hundred and forty-three times, and yielded four hundred and forty-four seeds, an average of 3.1 seeds per cross. Not too bad! One of the ﬁrst hybrids to appear has ever since remained near the head of the list: the immense shimmering white single, Chalice. In 1925 it was noted as a “corker” and is still widely so considered. Another almost as lovely is Seraphim. Most ﬁrst-generation hybrid peonies are sterile, at least during the earlier years of their growth. Some remain so permanently. Others, however, after the plants have attained to full maturity, may begin to set an occasional seed, though never very many, and these seeds produce plants which are of course the second generation from the original cross —F2 plants as the botanist calls them. In these F2’s a surprising and a welcome change occurs, for the natural fertility is in large part restored. So it is with the macrophylla hybrids: the F2’s have strongly viable pollen and are regular and abundant seed-setters. Among these F3’s are Serenade, Archangel, May Lilac, and the heavy seed-setter No. 4992. Then there are the “back-crosses” in which pollen from one of the hybrids was placed back onto an albiflora variety. This gave Garden Peace and Requiem. Professor Saunders recommended to the hybridist who might be trying to get double hybrids to make use of the Chinese peonies James Kelway and Lady Alexandra Duff, as he had had several examples of their tendency to throw doubleness into their hybrid offspring. Stemming from this cross are two fine triple hybrids. One of the white “Albi” — “Macro” F2’s crossed with officinalis Rosea Plena gave Pageant, a spectacular tall rose pink with a 4-inch shock of golden petalodes. Crossed with Otto Froebel, it gave Mid May, a vigorous plant with blush flowers. Another species from the Caucasus region is P. wittmanniana. “This is a plant,” wrote Professor Saunders, “which does not do well under the conditions i offer it. It is not widely listed and I think never has been; it was therefore always somewhat difficult to obtain, and this, combined with the difficulty of keeping it growing and alive in the garden, has meant that I have never at any time had many blooms to work with. Added to this is the fact that the cross is not one that takes with great ease, and hardly at all in the reverse direction. M. Lemoine reported to me that he had never had any luck with the reverse cross, but that his hybrids were the result of wittmanniana pollen on albiﬂora. He produced four lovely things and gave them lovely names: Avant Garde, Le Printemps, Mai Fleuri, and Messagere; they are not so well known as they deserve to be, although this may be because they inherit wittmanniana’s delicate constitution.” Lemoine made these crosses about 1890, and since then until about 1925, nothing further appears to have been done with this species. Wittmanniana’s flowers are of a most delicate pale ivory—paler than “Mloko’s.” Of the Lemoine hybrids, Messagere, is cream-color and the other three are pinks with a sort of cafe-au-lait cast to them. Professor Saunders raised some one hundred and sixty hybrid plants at one time or another, of which he likewise selected four for propagation: two whites [one has delicate greenish tints]; a third, Magnolia Flower, with blooms of a mauve and tawny-cream shade; Ballerina, the fourth, is the reverse of the cross; it is a smallish plant with very double cream-white blooms. He felt that this was a cross that might well repay further work by someone living in a climate better suited [wherever that may be] to wittmanniana’s needs [whatever these may be]. But it has always been a hard plant to obtain; it apparently has rarely if ever been offered in America. Coriacea, a species from Spain and the mountains of Morocco, happened to be in the collection of the Central Experimental Farm in Ottawa where some of its pollen was obtained in 1928. A division of the plant itself reached Clinton in 1933 and bloomed the following spring. In 1928 and 1934, forty-eight crosses were made of coriacea with albiflora. Result: 186 seeds. Ultimate results: twenty-four plants. “I had no pollen again,” Professor Saunders writes, “until 1940 when I made 16 crosses, and 1942 when I made 35. Total from these two years: 2 seeds!” The hybrids resulting from the 1928 and 1934 crosses were thrown together, being all very similar, and introduced as a strain under the name “The Lavenders” (usually sold as Lavender, ed). With charming pale lilac ﬂowers, these are distinguished and lovely plants. Seeds labeled “ozieri alba” were received from the world famous ﬁrm of Vilmorin, Andrieux & Cie, of Paris, in 1926. Seven germinated in 1928. Search through botanical and horticultural literature failed to reveal any mention of such a peony name. When the Vilmorins were questioned, they said the seeds had originally reached them from a correspondent whose name they had lost and they had no record of the matter, except that they had forwarded the seeds to America. Of such lack of records and resulting dead ends are many horticultural puzzles born. Professor Saunders’ notes say, “from its foliage it evidently belongs in the group Corallina-Broteri-Cambessedesi.” He crossed it with albiﬂora in 1934, and got seven hybrid plants, which he later put together and introduced under the group named “Halcyon.” Very early blooming, the waxy white flowers have marked purple ﬂares suggesting white Japanese tree peonies; these are prize plants. They even set seed with fair ease. “Ozieri alba” was also crossed with tenuifolia in 1934, giving nine ﬁne seeds. Germination: zero. That seems to be the complete Clinton story of this plant of unknown origin. P. emodi appears to be the only peony to grow wild in the Himalaya mountains. This is a tallish plant with many nodding small white ﬂowers and rather fernlike foliage. Here is a page from the notebook, on the long-drawn-out effort to establish this species in the garden. From 48 crosses in 1931, two-thirds were failures, and the remaining 17 gave only 65 seeds. Fourteen plants ultimately resulted, and one plant has been introduced, named White Innocence. It bears a number of ﬂowers on each stem, of which only the laterals produce seed, and these but few. This plant grows to almost five feet, and is the tallest, and latest to bloom of the Saunders hybrids. Emodi fathered two other beautiful hybrids, which we shall meet near the end of this chapter. And so we come to the end of all those hybrids which resulted from combining albiflora with some other species. Some eighty per cent of all Dr. Saunders’ herbaceous hybrids have now been discussed, and within that four-ﬁfths are many of his most signiﬁcant creations. There still remains, however, a number of interesting and beautiful races. But before going on to these, mention should be made of a heroic attempt, and tribute paid to the originality and persistence of another peony originator. In mlokosewitschi, the only truly yellow herbaceous peony, would seem to lie the most alluring of possibilities for a new hybrid race: its ﬂowers are a delicate pale almost lemon-sherbet sort of shade, nonetheless a true enduring yellow; the leaves a dull jade gray-green without sheen or gloss, slightly rounded at the tips; purplish-crimson stems complete the picture of what is after all one of our most beautiful garden plants. Alas, it has proved for many gardeners too difﬁcult to grow. But “Mloko” in bloom among a clump of Narcissus poeticus in May is a lovely sight, and those who wish to add distinction to their gardens should try at least once. Dr. Earle B. White, a former Washington dentist now living in Florida, was working on the cross during this same period. Dr. White persistently made some ﬁve hundred crosses a year between “Mloko” and albiﬂora, and did this for eight years before ﬁnally getting one hard hybrid seed. Then he had what is almost unknown in hybridizing —one hundred per cent germination! It came up! It came up, grew to maturity, flowered, and was unmistakably a hybrid. 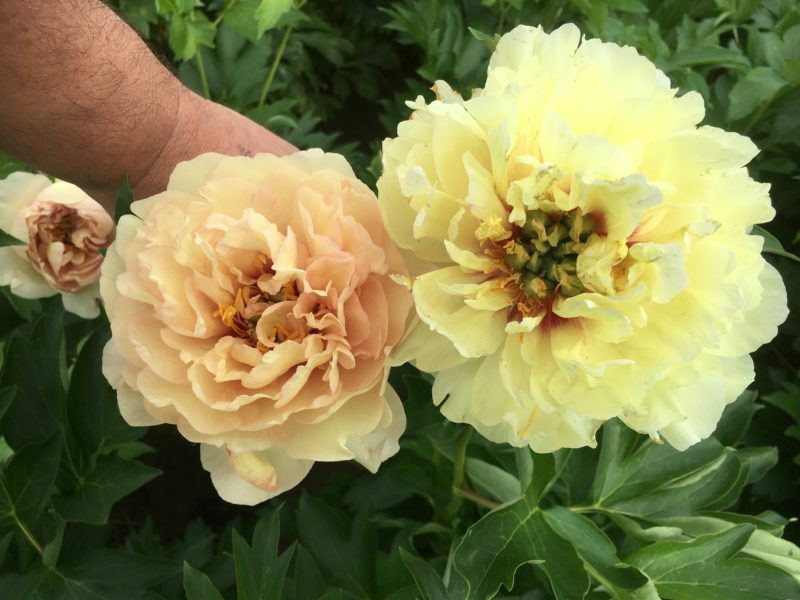 With pale ivory-yellow ﬂowers, and foliage midway between the two parents, it blooms in early June in Clinton, and is truly a distinct and beautiful addition to the peony world, quite aside from being a hybridist’s triumph. Named Claire de Lune, the stock is now owned by the Gilbert Wild and Son Nursery in Sarcoxie, Missouri. Following are hybrids made by combining any of the many forms of officinalis [including lobata], Otto Froebel and many more with one another or with other species (not albiﬂora). First are a charming group of rather dwarf plants [all fathered by the same “lobata Perry” that we met in the famous lobata hybrids]: officinalis Rosea Plena gave Little Dorrit [opaque salmon with bright red ﬂares]; Rubra Plena gave Scarlet Tanager [true light red], while Alba Plena gave Good Cheer [clear light vermilion]. Because the parents were closely related, these hybrids are fertile, and the resulting F2’s have very similar brilliance and charm. Coriacea [the same plant which, when crossed with albiﬂora, gave us the lovely “Lavender Strain”] was now crossed onto officinalis Rubra Plena. 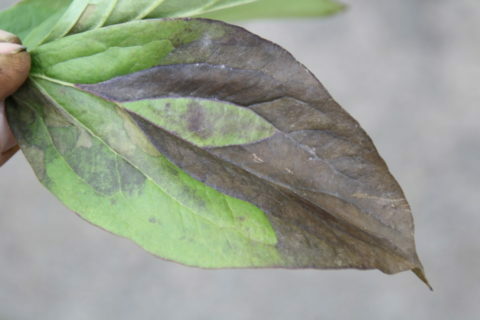 The result was a small plant with handsome glaucous [bluish-green] foliage, veined red, and with black-purple ﬂowers which was named Eclipse. This plant may prove difficult to grow. “Decora alba” when crossed with Otto Froebel gave thirty-four hybrid plants, of which the best was introduced under the name Diantha. This charming dwarf plant has very early ﬂowers of a delightful salmon-rose pink shade. There were a good many hybrid plants of officinalis crossed by macrophylla, but none was ever considered worthy of public introduction. Their value was proved in the nursery however, for when they in turn were crossed onto albiﬂora, several ﬁne and distinct triple hybrids were produced. Three of these are: Burgundy, a deep wine purple, Campagna, a ﬁne pure white, and Herald, an early brilliant scarlet. The many attempts to cross “Mloko” onto albiflora over a long period of years have already been noted. Albiﬂora seemed, to the eyes of the hybridist, the most desirably eligible of all the partners presented for “Mloko’s” favors. But it was therefore to prove the most heart-breaking of disappointments. Six additional species did give hybrid plants which, though never propagated or introduced, do still survive: broteri, corallina, emodi, peregrina, triternata [another Caucasian species], and veitchi. With two species and two only, did “Mloko” succeed in founding families. Like “Mloko,” these two are native to the Caucasus region, and like “M1oko,” both are very early blooming. Macrophylla acquaintance we have already made. 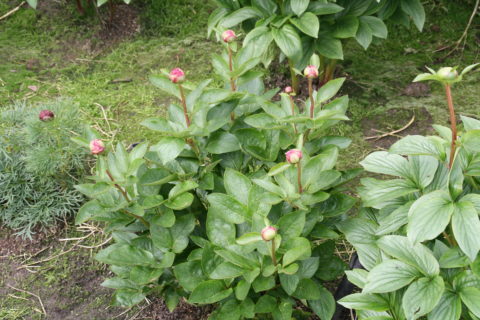 The other plant, tenuifolia, is one of the few peony species known to European and American gardens as early as 1765. This is the very small, very early, very ferny-leaved little peony found in many gardens. It occurs in several forms: Rubra [single], Rubra Plena, Rosea, and Rosea Plena. But the reverse cross, “Tenui” X “Mloko,” gave in the second generation not only the early tea-rose Gwenda, but then her own child Daystar [therefore an F3 which opens its ivory yellow ﬂowers with the earliest peonies, about mid-May. These two have large broad glossy leaves, not like either parent. Nosegay, wenda, and Daystar are good seed-setters, and because of the blood in their veins, would probably repay further work. The F2 Gwenda was crossed onto a double albiﬂora to produce three beautiful and quite distinct children: Roselette, a tall very early pink and a good grower; Rushlight, a pale ivory-yellow, taller than Daystar or Nova; and Sprite, a white with apple-blossom tints. Both Roselette and Rushlight have viable pollen and set seed. “Mloko” crosses reluctantly with macrophylla, but by good fortune the hybrids are fertile in the ﬁrst generation. “This is surprising, for both in appearance and in chromosome numbers they are different, “Mloko” being a diploid while “Macro” is a tetraploid.” The hybrids have characteristics of both parents: Coarse leaves, pale ivory-yellow ﬂowers, and extreme earliness. 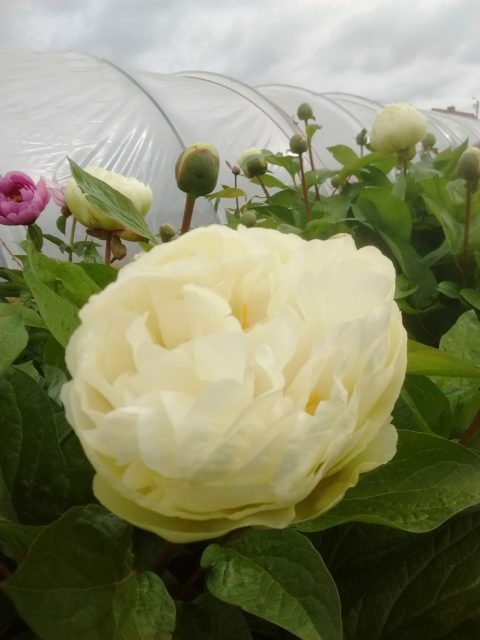 “This race should certainly be used in further crosses, as they would be likely to give something interesting.” The F2’s, of which the best is Nova, take after the parents, so that in time one may have from seed a nice little planting of early pale yellow peonies. The fertile hybrids of “Mloko” x “Macro” were crossed onto a number of plants, for here of course there seemed to lie one more possibility of obtaining a race of yellow hybrids. Two triple hybrids [albiflora by the hybrid “Mloko” x “Macro”] still exist under the numbers 14400 and 14414. Tall plants with very early pale ivory ﬂowers, these set seed. Although never catalogued, this triple strain should surely be used by future hybridists. The “Mloko”-“Macro’s” were also crossed onto various forms of Officinalis: with Otto Froebel they took fairly well and produced a strain of triples that were fertile and that were themselves crossed onto albiflora. The resulting plants are thus Quadruple Hybrids, for in them are combined the bloods of four species: “Macro,” “Mloko,” officinalis, and albiflora. Numbering some one hundred and twenty all told, these plants began to bloom in 1943, and are thus the last hybrids to come from the Saunders hand. First catalogued in l949, some dozen or ﬁfteen are now listed. The prevailing color of the flowers is an ivory sheen quite unique and beautiful. Many of them, like Lady Gay, are strikingly flared —a few, like Papilio, are delicately veined like a butterfly’s wing: Starlight, which, though very like Dr. White’s Claire de Lune, blooms a week earlier, and Sunlight, are clear ivory yellow. Firelight is a ﬁne bright early rose-pink. These hybrids are nearly sterile though of course like most such things not absolutely so, and there are little F2 seedlings coming along in the seed-beds which should be blooming in a few years. One plant of the Mediterranean species corsica reached Clinton from Barr’s nursery in England in 1924. It died. Two plants came from Lemoine in 1928. One died. Four more plants came from Barr again ﬁve years later. The ﬁve plants were widely used in crossing, and with macrophylla a hybrid was produced, named Picotee, a delightful little thing whose white ﬂowers are edged — “picoteed” — bright pink. It is fertile, and its children closely resemble the parent, in this case a most happy circumstance. 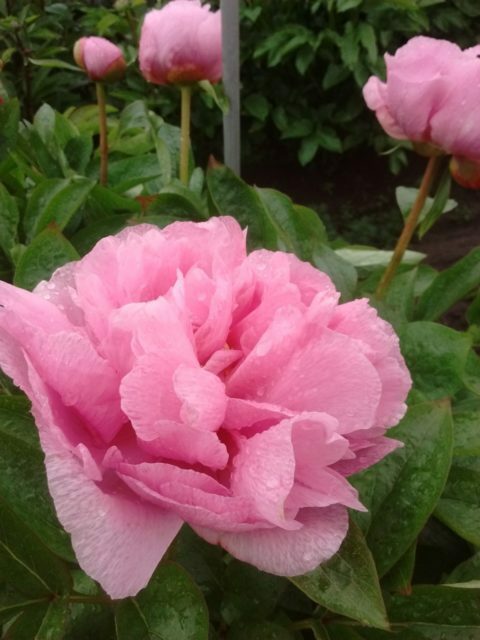 One of the most beautiful and distinguished of peony species is willmottiae, from western China. Its‘ large, elegantly-formed leaves, presented horizontally in three’s, are of a deep bronze, and of so dull a ﬁnish as to have a “bloom” like the grape. Against and above these, ﬂoat ﬂowers of an absolute and indescribable whiteness; this plant is unmistakably among the bluebloods of the garden world. It should be far more widely grown. Alas, where to obtain it? Two plants reached Clinton in 1917 from the English nursery of Allgrove, and were used in a number of crosses. Of the cross with macrophylla, one, Silver Dawn, was introduced. It is a lovely white and the name describes it well, but is it lovelier than willmottiae? These three species are generally considered to be closely related to one another, and are all perhaps forms of anomala. Woodwardi blooms ﬁrst; its ﬂowers are rose-pink. Veitchi comes next; with its rather deep magenta-ish-pink ﬂowers, it is less pretty. Beresowskyi blooms latest of the three but its ﬂowers closely resemble those of woodwardi. All three are from western China, and all three were in the course of time represented in the Clinton nursery. They were tried out with various other species, and three hybrid plants were eventually introduced. Tenuifolia x woodwardi produced the little Earlybird, a bright unfading crimson. Last perhaps, but far from least, come the “Windﬂowers.” This is a strain, or rather two strains, produced by crossing the Himalayan peony emodi with two other Asiatic species. 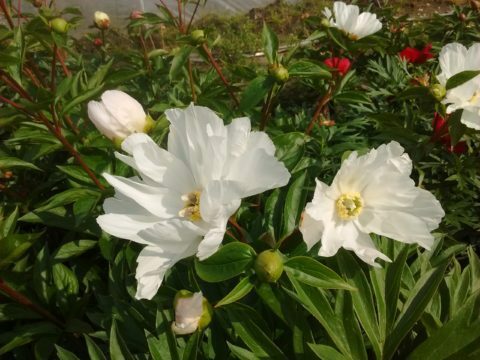 Charming tall plants, better than emodi itself, extremely vigorous in growth, and with nodding white flowers, these hybrids are like white autumn blooming Japanese anemones. Early Windflower, derived from veitchi, comes into bloom about May 20, to be followed in a week or ten days by the late form (Late Windflower, ed). They are among the very loveliest of garden hybrids. In this section an attempt has been made to give a picture of a half-life time spent in cultivating peonies. Without overstating either the failures or the successes, we hope to have conveyed some idea of the combination of scientiﬁc thoroughness and persistence of mind, compounded with what must have been half inspiration, half hunch, that were necessary in order to overcome the repeated exasperations and defeats, not to mention the vagaries encountered in plants and in nature herself. The whole ﬁeld of peony hybridizing, far from narrowing itself down to a few lines, has opened up into a vast terrain. The few fertile ﬁrst-generation plants and the many more second-generation hybrids in which fertility has been completely restored, have revealed an immense new series of crossings to be initiated, in which only the beginnings have been pioneered. This may be the place to say that from Professor Saunders’ nursery, hybrid plants of many of the strains described herein may still be obtained, by hybridists and others interested for scientiﬁc or breeding purposes, without their incurring the full expense of the “garden” varieties listed‘ in the catalog. Those lines that appear to offer the greatest prospect of success and interest have been indicated; but who of us dares predict where the future of the peony may really lie? The Peony Society 1 year, 3 months ago.